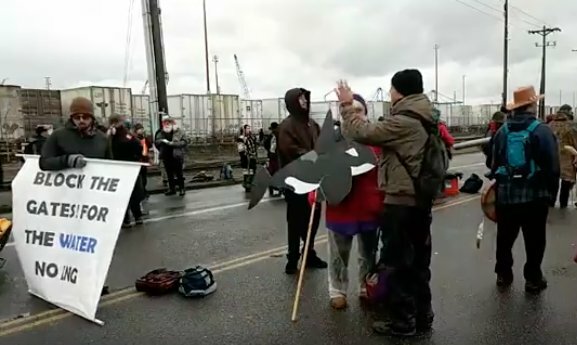 150+ Water Protectors are still blocking all entrances of the construction site to the LNG facility in Tacoma, WA. * It is being built without the consent of the Puyallup, whose waters, salmon and air it threatens and treaty fishing rights it violates. * If there was an accident at the facility, an explosion would have a 3.5 mile blast-zone range, destroying surrounding communities. The action comes four days after a Tacoma jury acquitted two women who locked down to construction equipment last May — the jury found them not guilty because they said they could not tell whether the action took place on Puyallup territory or City of Tacoma-owned land. The action also comes four days after activists used tripods to block all three gates to the site in the early morning and a week after two men kayaked across the Hylebos Waterway, scaled a fence and climbed a crane to halt construction of an 8-million-gallon gas storage tank.